Because talk titan Rush Limbaugh rarely delves into the inside workings of the talk radio business, it was fascinating to hear him take a thinly- veiled shot at his own employer yesterday. What causes these infrequent moments? Does his irritation with our crazy (and very sleazy) industry sometimes become too difficult to keep bottled up? In this case, he seemed to chastise Clear Channel Communications for almost single- handedly saving Air America Radio from collapse in early 2005. For the company, the results have been underwhelming, to say the least. 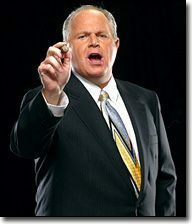 Limbaugh's program is syndicated by Premiere Radio Networks, a division of Clear Channel. "Everybody is saying that the Fox News guys were released 'unharmed.' I don't consider it to be 'unharmed' when you have a pistol pointed at you and you must renounce your faith and convert to Islam." "There's a message here. This is a glimpse into our future. This is their stated goal: You don't convert, you die. You remain an infidel; you're going to be a target." "They asked Clinton about Hurricane Katrina on television over the weekend: 'Well, you know, I probably would have done a little more about it because I have such a special attachment to that area.' I'll bet. The red-light district." "Algore also blames consolidation on the fact that nobody listens to liberal talk radio. They're out there in the market! If it weren't for a couple of big ownership groups out there, Air America wouldn't be on 90% of the stations that they are on." Actually, Rush, it's hard to think of a second ownership group that has supported Air America the way we've witnessed with Clear Channel. Clearly, Gore doesn't know what he's talking about, because libtalk probably wouldn't be on the air today without the company's major stamp of approval. And 90% of that consists of right-wing talk. It figures that the o'sleazy factor works its way in there. location to be announced sometime in "the fall." I understand the ABC Radio Net is in the process or has just been sold and may be totally eliminated. Nevertheless, I'd like to know where John Batchelor will be in the future. Certainly the best show heard in the evenings (except when Savage is on). John, let us know, & start another website with comments. What exactly has Michael Savage said that you dislike? Susan - you may regret having asked that question. I think Batchelor may have gone over his head with guests like John Fund, and all the synthetic terror-mongering. What I DID like about his program is that Batchelor was light-years above the rest of that station's on-air personalities in terms of quality, character, dignity, and level of sophistication. To replace him with Ingraham, I'm sure, has got to be the cruelest cut of all-and I cannot see many listeners taking kindly to her brand of filth. I predict a small but significant portion of Batchelor's audience will catch Lionel, at least for a while. His sizable pro-Zionist contingent will migrate back to Talkline with Zev Brenner, or the Internet. Good grief--Laura Ingraham is no substitute for JB. With regard to John Fund, how would you then defend his having Katrina Vanden Heuvel, etc. on? I'm grateful. But he's also sadly backtracked on several occasions. To me, the bottom line is terror is a world wide thing, and the Iraq war is just an excuse for certain people to make money & rob US citizens. I'm a republican, but I'll probably never vote again.